Start with a large jar or container of some type. You will place this on the table at your wedding reception that holds the guestbook, etc. You can also do this at the wedding shower, if you prefer. Place small note cards on the table next to the jar. You will want to include a sign that gives your guests the instructions they need. 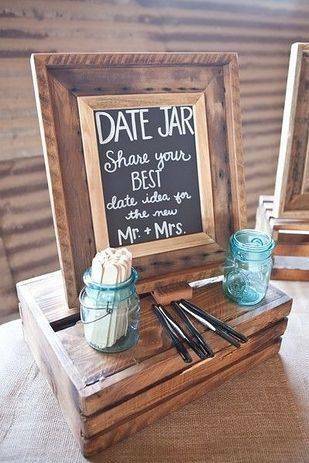 Simply ask them for their best date ideas for the bride and groom. The wedding guests will write down their favorite date ideas on the note cards (or whatever you choose). It might be something like “summer picnic at the beach” or “appetizers and a movie,” or whatever your loved ones choose. In any case, you will get a wide variety of ideas that you can use to create date nights in the future. Throughout the first year of your marriage, create a “date night,” and as you plan each night, remove a card from your jar and use the idea you pick. This can be a lot of fun and will certainly keep things exciting. It’s also a great way to get your loved ones involved!